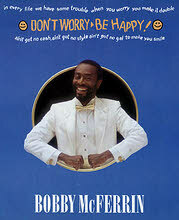 If you’re looking for a song to cheer you up then a good one to try is the classic Bobby McFerrin song Don’t Worry Be Happy. So popular was it that it has been used in so many films, TV programmes and adverts over the years you can’t fail to have heard it. The song was written and performed solely by McFerrin, and by perform I don’t just mean singing the vocals, but the entire music track. The music is an a cappella track, which if you don’t know means that no musical instruments were used to create it. Instead the entire tune is made up of different layers of Bobby McFerrin making musical sounds with his own voice (you know, dooooo-do-do-do-do, that sort of thing). The song has a very laid back reggae style to it, with lyrics that illustrate several different problems that might (perhaps) crop up in your normal life, problems which you are then told to get over by just not worrying, and being happy. The song hit the top of the charts in the US and just missed out in the UK as it only reached number 2 (I’m surprised too, I was quite sure it hit number 1 in the UK but apparently not). Whilst this success was predominately down to it being a great song, I’m sure the fact that Robin Williams (wearing something that looks like he’s just come from an Arabian market) featured in the video didn’t hurt either. This entry is filed under Music - Songs	and was posted on May 6th, 2011. You can follow any responses to this entry through the RSS 2.0 feed. You can leave a response, or trackback from your own site. Apparently not, he is in fact still alive. I believe this was an Internet rumour started a couple of years back.